Spissistilus festinus (three-cornered alfalfa hopper) is one of the few truly economic pests in the otherwise bizarre and innocuous family Membracidae (treehoppers). Its common name alludes to one of the crops it affects, but my encounters with this species are most often in soybean (I am, after all, a soybean entomologist). Damage in this crop is caused by both adults and nymphs, whose piercing/sucking mouthparts cause girdling and breakage of the stem—often just a few inches above the soil. This individual was seen during my travels last week in a soybean field in Stoneville, Mississippi, where numbers throughout the season were especially high this year. Although I have seen innumerable S. festinus adults, I have never noticed their crazy, zig-zag patterned red and white eyes until I managed this closeup face shot (click on photo for best view). This slightly cropped photo was taken with a 100mm macro lens and full extension tube set, resulting in slightly more than 2X magnification. One of the lessons I took from BugShot 2011 was the need to pay more attention to background and value contrast. By placing the subject a few inches in front of the dark green soybean foliage I was able to achieve a much more pleasing background than the typical black background one gets with full flash photos at high magnification. Although both the subject and the background are green, there is still sufficient difference in shade to create contrast between them. Light-green is one of the more difficult colors to work with when full flash is used with high shutter speeds and small apertures to maximize crispness and detail (in this case, 1/250 sec and f/16). However, increasing ISO to 400 and lowering flash exposure compensation to -2/3 can reduce the amount of flash needed to illuminate the subject with such settings, making it easier to achieve a properly exposed and true-colored subject. This entry was posted in Hemiptera, Membracidae and tagged economic pests, entomology, insects, lighting, Mississippi, nature, photography, science, techniques, treehoppers, true bugs. Bookmark the permalink. wow. just a GREAT photo, interesting stuff, and yes, TRIPPY eyes. Nice. Plus, who can resist a post titled “crazy eyes.” Not me. =) I’m heading toward ND, so perhaps I’ll run around and see if I can find any of these guys. Thanks, biobabbler. TCAH isn’t nearly as prevalent in northern latitudes as the south, and soybeans in North Dakota are probably starting to dry up now anyway. There are, however, a number of species in this and related genera that can be found on herbaceous plants. To the naked eye they just look like little green chunky triangles – but through the camera lens it’s a different sight! 😀 All glory to the hypnohopper! Wow, that’s pretty neat…I love how you can see the textures! SO aptly names — those truly are some crazy eyes! he’s like, hey, hows it going? Very cool! Great picture of a very interesting looking creature…Thanks for sharing and congrats on freshly pressed! I’m glad this little tree hopper is looking out for my ecosystems! Wow, that’s an amazing picture. I love that photo! I’ve also had trouble capturing light green so I appreciate the camera tips. I find that little guy rather endearing and I was disappointed to learn that they are destructive pests. Interesting post nonetheless. Those are some crazy zig-zag eyes. Beautiful. This is an amazing post and picture! I can’t believe it! Come read my blog at thoughtcreator.wordpress.com. I just like to write poetry, short stories, and articles, and would love feedback from such an amazing blogger! This is amazingly shot! Great article. Thank you! Great photo and dialogue. Great photo, I love searching out and taking photos of the critters that live in my garden! So cool! Nature is truly amazing! Great photo. I found a tree hopper nymph on my grapes this summer and spent several hours trying to ID it. The nymphs are really unique in appearance! That’s insane. Nature is a wonderful thing. the sight of it makes the hair on my neck stand up. Great shot. I need to learn what the manual settings on my click and point camera actually do! I think its very cute – its eyes are cute, too. Lovely natural color. Hey Ted, congrats on the fresh press!!! Thanks – an unexpected surprise! They look cute! Love photos like this, keep it up! The picture is wonderful and the Spissistilus festinus is amazing, it´s cover is like brilliant and the color is beautiful. The only bad thing is that this insect is a pests. The form of take this picture is very good. Very impressive photography! I love his eyes as well as his green sparkled body. Entomology must be a fascinating field. Those eyes are intense – but gee, I feel like I should cut down on my intake of soy crisps. That picture sends shivers down my spine but it is awesome, intense. Having a unique job, you must love it! crazy eyes is right! nice shot! What may be the function of this kind of eyepattern? I can not really imagine that this may be a kind of camouflage…. 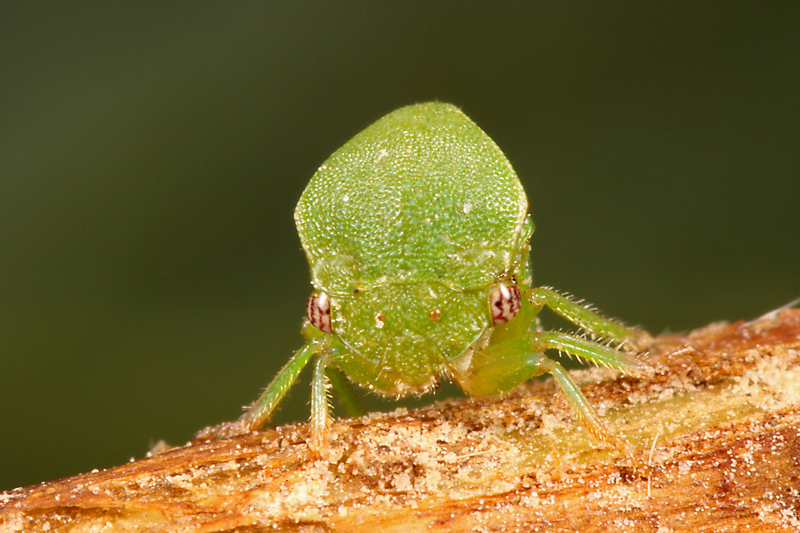 Though I am much aware of tropical species from the order Hemiptera, i am quite fascinated with this treehopper. The picture really looks fantastic though the effect that this insect causes is not good (e.g. decrease in plant yield etc. )I love your blog by the way! 🙂 I’m an entomophile too. Does the pest as virus vector? i never seen this pest before in Indonesia. not on soybean or rather. Great Post. WOAH what a cool picture. Great Job . Interesting post. Learnt a lot! Thanks!